Have you ever wondered what it would be like to be a cat? Cats have a noble grace about them, some might say they even have a bit of a superiority complex. They are able to lounge on furry rugs, take up position on a comfy chair, and delicately balance on the windowsill to keep a beady eye on the neighbors bird-feeder. Human beings have decent vision, although some of us couldn’t survive without our specs or contact lenses to drive or read that bestseller. However, compared to cats we come a poor second on most counts. 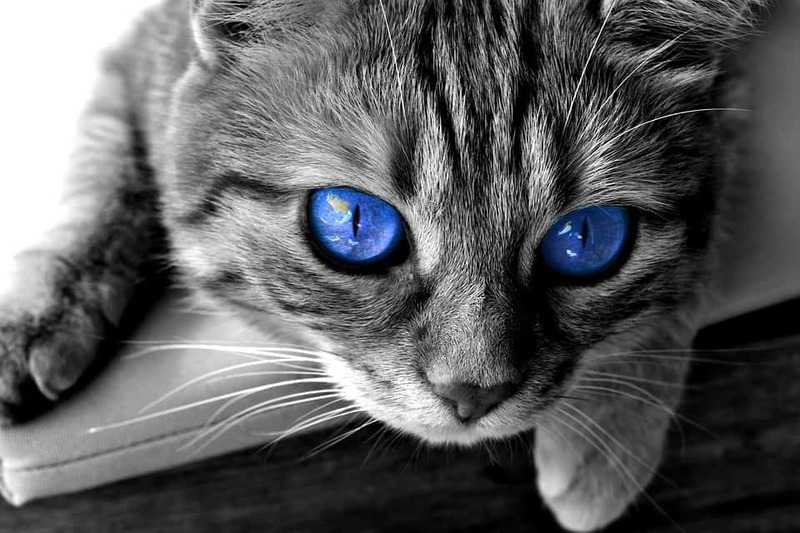 Cats have amazing eyes, which are very distinctive to look at. They are a different shape to our eyes, we have pupils that are neatly rounded, whereas cats have pupils that sit up vertically. Cats seem to have mastered the art of looking and seeing, and don’t seem to miss a trick. They are equally at home parading through the streets by day and holding court within alleyways by night, we can’t help but think that’s cats sometimes have a better social life than we do! Highly reactive, a cat can use his eyes to follow people, animals or objects that are moving at great speed. They are super sensitive to movement, that spider that you caught a glimpse out of the corner of your eye a few seconds ago? Chances are your cat has already seen it and is a whisker’s length from pouncing on it. This ability to glimpse the smallest movement is based upon the way in which a cat’s retinas are formed. Acting almost like a camera, the retina instantly notes movement, capturing over fifty new “pictures” every single second. As humans we have to digest what we see, allowing our brains time to catch up. Compared to our feline counterparts we are slow to catch the action! Cats aren’t quite as proficient when it comes to seeing in color, but they don’t let that little fact bother them. Why do cats need color? Hues and shades are for humans, felines are quite happy in a black and white world. Your kitty can make out certain colors – in particular blue and green. However, yellow is difficult for them to compute and you can forget red – the color red doesn’t even exist in the feline world. Cats have excellent night-vision and back in 1934 Percy Shaw of Halifax in the United Kingdom took inspiration from their glowing eyeshine (take a look at a cat’s eyes at night time – they tend to have a glossy, ethereal quality), inventing reflective lights. Shaw called his invention “Cat’s Eyes,” and the reflective lights would go on to line the roads of Great Britain, then roads all over the world, in an attempt to improve road safety. Cats sometimes struggle to see distinctive shapes or objects as well as humans. They don’t pick up the same clarity and vibrancy, especially if an object is over 20 feet away. Then it might appear to be slightly blurred and kitty might find it difficult to focus on it. Cats have large eyes and this can make it tricky to see things that are very close up. Imagine you are a cat, scrambling low down on the floor at a low level. You are trying to sneakily negotiate your way along the garden and over the fence, where you know Mrs Jones over the back tends to leave her bins, which often contain remnants of her fishy dinners. You know that the foxes usually get the blame for breaking and entering, they just aren’t as wily as pussycats! This is where having whiskers becomes very useful. You can use your whiskers to feel your way, making sure you dodge obstacles such as the pesky garden spade and those silly gnomes. You can ascertain if an opening is wide enough to fit through too. That gap in the fence was fine on the way to Mrs Jones’ bin but after all that tuna it’s a very tight squeeze to get back through and your whiskers bristle a warning as they brush the fence panels. When it comes to eyesight the cat has it in the bag. Able to track fast moving objects and pick up on movement, cats are able to react much faster than humans. Their lack of ability to see in full color doesn’t hinder them, and the fact that they can’t pick up on the same vibrant images as humans doesn’t seem to slow them down either. As creatures of the night cats relish the dark and for many it’s their favorite time to go and explore the world, with great night-vision and the ability to use whiskers as a bump-and-go sensor no wonder cats come out on top. Cats are certainly interesting creatures and although we have learnt many fascinating facts about them already we can’t help but feeling we will keep on discovering more.